Update: I have since published a forge module rnelson0-local_user that can be used to distribute keys as well. If you are using keys with local users, I highly recommend using the forge module. If you are not managing the users directly (say, for domain-joined nodes), continue to use the solution presented belwo. Today, let’s look at deploying SSH Authorized Keys via puppet. An authorized key is a public key used for public key authentication (not to be confused with an ssh key, which is the unique key identifier of a host that verifies the server is who it says it is). By attaching an authorized key to a user, any login attempt for that user that presents the corresponding private key will be authenticated successfully, giving you the ability to log in without a password. This is commonly used for automation, where no user is present to enter a password, or for a user with a private key to access systems without additional steps. Authorized keys are typically considered more secure than a password, but they rely on protecting the private key. If the private key is not secured, anyone who obtains the private key can impersonate the account. If a non-privileged user’s key is lost, only that user’s access and files are at immediate risk. An attacker would still need to escalate privileges to damage the system. If a privileged user’s key (no-one reading this logs in as a privileged user, such as root, right? RIGHT?) or an automation account’s key is lost, the immediate risk is much higher. An attacker might gain access to the entire system or be able to attack other systems. You must absolutely secure private keys and ensure you follow the principle of least privilege for all users, especially automation accounts. Let’s look at an example of how to use a properly secured authorized key. In past articles, we’ve built a yum repository and a build server. You may be logging into these servers frequently and transfering files between the two. Every time, you need to enter your passwords. That gets old, quickly. If you had an authorized key in place, you can ssh to both servers and present your private key, no password. If you copy the private key to the build server or create a new key, you could scp files from the build server to the yumrepo the same way. This should make life a lot easier for you. There are lots of ways to generate keys depending on your OS and applications. My workflow is to use Putty on a Windows 7 laptop to connect to linux VMs, then use the linux openssh client to ssh to other linux VMs. I’ll cover generating and configuring keys with Putty and openssh. 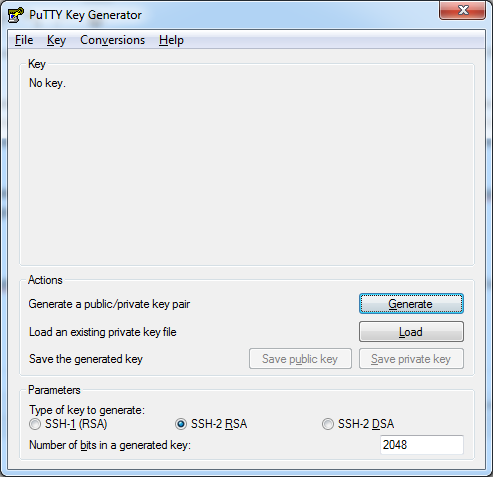 Windows users can download putty and puttygen here. Run puttygen first. The key generator is very simple. Select the type of key (SSH2-RSA) and number of bits (default is 1024, I suggest 2048 or higher) and click the Generate button. You’ll be asked to move the mouse around a specified area to generate randomness (entropy). When you’ve generated enough, you’ll have a key. You need to click on the Save private key button and secure this key. You’ll definitely want to make sure it’s available to you in the future as well, so back it up. A secure cloud storage service, in a folder that is NOT shared, might be a good location. You probably want to Save public key as well, though if you save the string above, it’s not strictly required. To use this key, launch putty. Under Connection -> SSH -> Auth, point the Private key file for authentication: to your private key. Next, go up to Session, enter Default Settings in the Saved Sessions name and click Save. This key will now be used by default when connecting to any IP address. On my linux VM, the openssh ssh client and ssh-keygen applications are already installed. These are typically present on most modern *nix systems, so these steps may work for your OS with little to no modification. Run ssh-keygen -b 2048. The default type is SSH2-RSA, as we used with putty-gen, but the byte default is 1024 so we want to override that. You may optionally enter a passphrase. This is like a password for your certificate and you may not want that. You certainly do not want a passphrase for automation keys, since either no-one will be present to enter the key or the automation script will enter it automatically, defeating the purpose of a passphrase. After you provide or skip the passphrase, you’ll be provided with the location of the private and public keys and a fancy-looking randomart interpretation of the key. If it’s not pleasing to your eye, then it’s useless and you can forget about it, otherwise print it out and put it over your desk. Lastly, cat the pub file and you’ll see a string similar to what puttygen provided. Comment: "2048-bit RSA, converted from OpenSSH by rn7284@build"
Comment: "2048-bit RSA, converted from OpenSSH by rnelson0@build"
By default, the openssh ssh client will use the key stored in ~/.ssh/id_rsa to identify itself to remote systems. You can generate an additional key with ssh-keygen -f and use it with ssh -i ~/.ssh/ … as required. You likely won’t need this for an individual user, but it can be helpful with automation where you want separate keys for each remote system to reduce risk to those remote systems if a particular private key is made public. We’ll assume going forward that only the default key has been created and is being used. The server refuses the key and requires a password. Presenting the key doesn’t harm anything, but it’s not helping either… yet. Let’s define a key in the file ssh_authorized_key.pp and apply it. Note that there are no line breaks in the manifest, I simply added some for readability on this blog. Authenticating with public key "rsa-key-20141029"
Success! You can now authenticate using the key rather than a password. However, if you ssh to any other node, you’ll still need to use a password. The key needs to be present on all nodes in your network. We could take the ssh_authorized_key resource in the manifest file and insert it into profile::base. That would add it everywhere, or at least try to. Puppet can manage network and windows devices, and what happens if you apply the same resource there? Would you want to apply the resource there? We could avoid such potential problems by defining profile::authorized_keys::administrators. By applying this profile to the correct roles, we have a bit more control over which nodes have which authorized keys, but we’re still having to define and apply profiles properly. There’s another way. Commit your change, push the new branch upstream, and re-deploy your environments. Run against the authorized_key_demo environment and you shouldn’t see any changes on the build server. Delete the .ssh/authorized_keys file and puppet will recreate the file. Voila! If you merge this into production, then all nodes should shortly have this key. Before we do that, let’s look at a second problem. We solved the issue where a non-puppet-managed node wants to authenticate to a puppet-managed node. I can ssh from my laptop to all the nodes, yay. If I’m on the build server and need to scp files over to the yum repo, however, I’m still stuck typing in a password. If you join your linux VMs to an active directory domain, this may not be an issue for you as your kerberos tickets will follow you around, but we’ll assume you’re not that lucky so we have something to do. The hard way, but possibly more secure, would be to run our openssh keygen process above on every machine for every user and add the public key to hiera. This doesn’t scale well. X users, Y nodes, you’ll quickly have X*Y keys to manage. Revoking a key becomes tedious as well, you have to generate up to Y new keys. Instead, we’ll look at host based authentication. By enabling this on your nodes, all users from specified nodes can ssh to the other specified nodes without a password. This requires working DNS (forward and reverse), some ssh configuration modifications, and a design decision to allow this communication. Our configuration will allow all users between all nodes, but you can narrow that down to users and groups if you’d like. The other thing we need, since we’ll be doing this via Puppet, is puppetdb. Thankfully, we already installed that. Our guide specifies three items, an shosts.equiv file and ssh host and client configuration. We’ll focus on the configuration first. You’ll find that the output file is very wordy and likely has duplicates. You could pipe it through sort | uniq, but then you lose the ordering that helps you relate hostnames to IP addresses. This server is intented for use by the Nelson family. All other use is unauthorized. If things aren’t working properly, you can troubleshoot by stopping sshd on the server and then enabling debug mode on the server and client. debug1: Connecting to yum [10.0.0.252] port 22. Check the references section for some troubleshooting assistance, and of course google will hopefully have results. If you receive gethostbyname errors, be sure to check your forward and reverse entries of BOTH sides – the debug information does not always make it clear what hostname is being looked up. Once everything is working well, be sure to merge your changes back into master/production and deploy your environments so that all nodes can benefit from the changes. You can now ssh from your windows desktop to your puppet managed node and between the puppet managed nodes. You can add new users to hiera without modifying your puppet code at all. You can restrict inter-node host based authentication further, to users and groups, if you desire. But what you don’t need to do is type your password in all the time! I hope this helps make navigation in your network a bit easier. There’s one item we’ll have to look at later. Puppetdb will retain hostkeys forever until you start to tune it. If you destroy a node and build a new one with the same name, you’ll find two keys in your /etc/ssh/ssh_known_hosts for the hostname. This can clearly be a security gap as defunct node IPs could be re-used and end up with access to your network. You can review how to deactivate decommissioned nodes, but I’ll get to this eventually. Thanks for the post. i want to be able to revoke ssh keys or set it to expire after a period. How can i achieve this? The Puppet ssh key resources I do not believe allow for the flexibility you want. You can, however, set the ensure attribute to ‘absent’ to remove resources. I feel this is best done as a one-off, rather than in your regular manifests, or you risk after a few years go by having a very lengthy list of deleted resources that would never actually be present anymore, anyway.